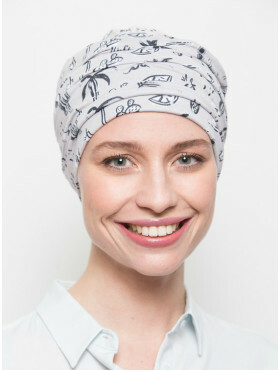 We can’t think of many chemo headscarves that are as easy to use as this specially designed Liz headscarf for cancer patients. Don’t feel like wrapping or draping? Worried your chemo scarf might suddenly come undone? Does your arm bother you after an armpit operation? Then choose this pre-shaped Liz chemo scarf: slip it on like a hat, tie the ends of the sewed-on scarf once in the nape of your neck and that’s all there is to it!